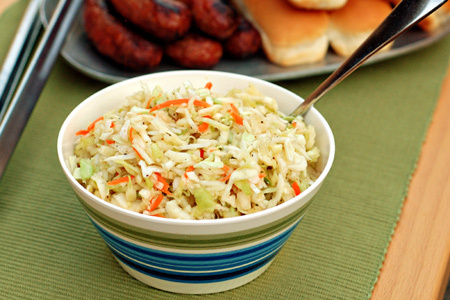 In the past I've shared a couple different slaw recipes. One is a Southwest creamy and spicy version, and the other walks the line between creamy and tangy. 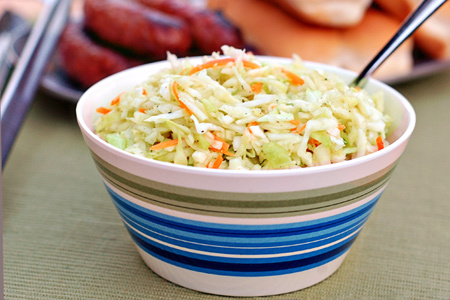 This time I offer a simple vinegar-based sweet and tangy slaw that packs big crunch. This version is a great balance to sweet barbecue. It's tailor-made for a monster sauce-all-over-your-face and juice-running-down-your-arm pulled pork sandwich. Oh, and it's also great atop a grilled brat with a little mustard. Since there is no dairy in this recipe it's perfect for outdoor events where you don't have access to ice or refrigeration. It holds up very well without the food safety concern of mayo-based slaws. Combine all of the ingredients, except the slaw in a large mixing bowl and whisk until the sugar is dissolved. Add the slaw and fold to coat it all. Cover and refrigerate for 3-6 hours, or overnight, stirring occasionally (whenever you think of it). We made this for a barbeque over the weekend and it was excellent! Everyone appreciated the tangy vinegar base, perfect for a 100+ degree day! thanks for sharing! this is an awesome recipe. loved it! Made this with BBQ, everyone loved it! Anonymous - I don't know how many people it will feed,, as that is appetite-dependant, but it makes about 10 half-cup servings.